When a new geocache is published the first cacher to log the find earns the designation of “First to Find” or FTF. I got one today. The cache is in a spot that my kids and I spent a lot of time at when they were young. The cache itself is delightful and the owner took a lot of time to put together some thing special. 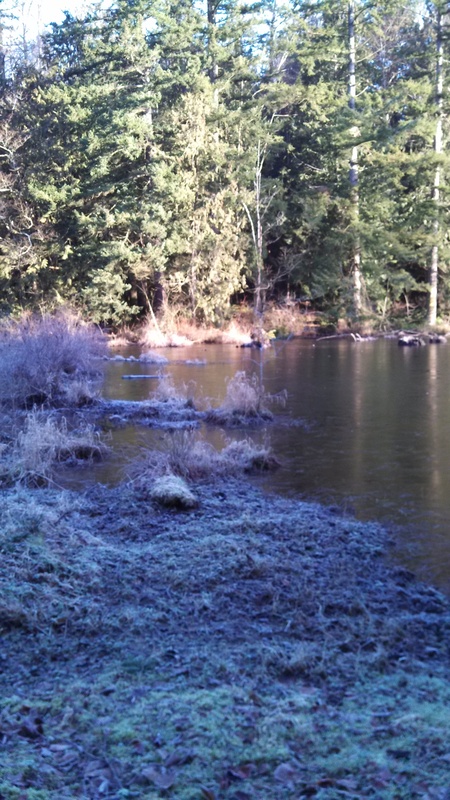 There are some lovely trails out at the site and I was able to get in a quick one mile walk on a sunny but frosty morning. After six plus years, it is still here – guess blogs don’t die. Still don’t know how to take it down, so maybe I’ll post some more. My kids are older – that is a good thing. The girl is in college and doing very well. The boy is in high school, karate and Scouts. I am still working, and still wondering how I landed in this job. But to be working and close to home is good. Sewing is not quite on the top of my list of things to do right now, but I have so much fabric and need to work through that. Maybe this is just a break from the years of trying to better my craft. Most of my tops in my work wardrobe are sewn. My new obsession? Going outside, hiking (more like walking in the woods) and geocaching. My job is sedentary and it still hurts to sit all day. We are not doing ourselves a favor by making humans sit (or stand) for 8 plus hours a day. Moving is the best thing I can do for myself. I live in one of the most spectacular parts of the country and am so lucky that I can take a hike every weekend without having to travel great distances. 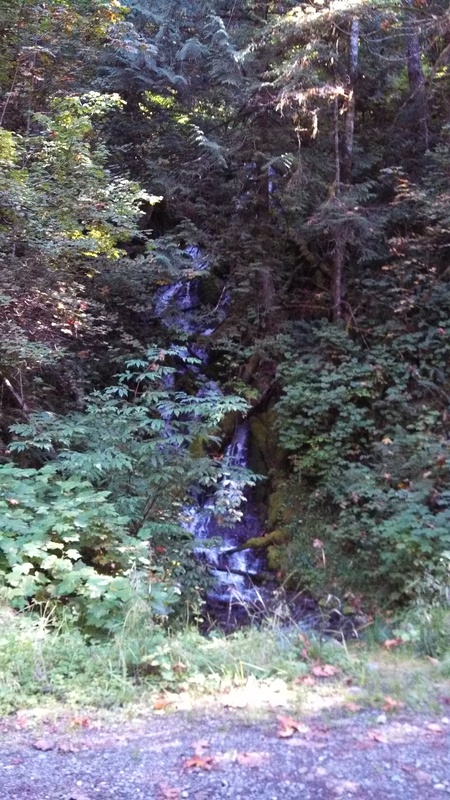 I would like to document my hikes, share what I see. Let’s see how that goes for now. I have been toying with the idea of shutting down this blog. There is no time to feed the blog. In fact there is no time to even figure out how to shut it down. What’s a girl to do? When I do call the blog up I am surprised at how many people visit a seriously neglected spot on the Internet. I have a whole slew of sites that I visit and I am in awe of what they are able to share, how well they write, how interesting their lives are. 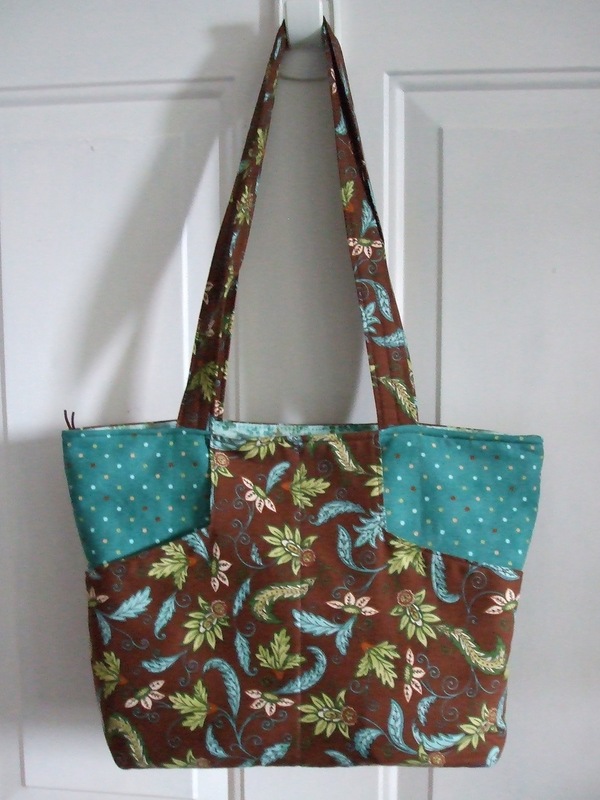 I have been sewing; this summer was all about purses. 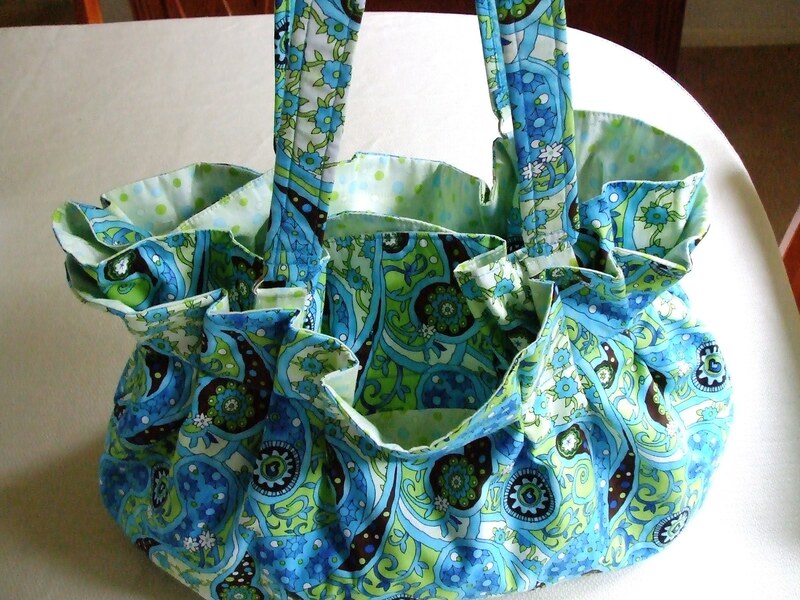 Here are some photos of the three purses I made this summer. The first is too big – The Carolina Handbag from Studio Cat. Next was the Day Bag by Nicole Mallalieu. Too small. Given to a friend. 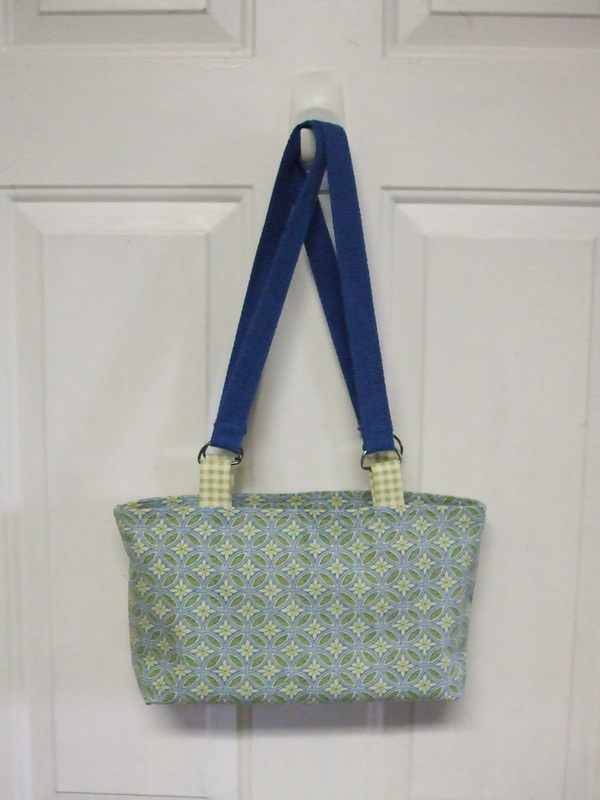 And lastly, the winner – the Margo Bag from Lazy Girl. Love this bag. I have fabric ready to go to make another one! The blog is now fed. Let’s see what happens. At the end of March I was working on a pair of Jalie stretch woven pants but couldn’t quite get them finished. All and all I am amazed at what I did in 60 days. During that time I also went to Expo and welcomed a Janome CoverPro into the sewing room. We are still bonding, but all of the knit shirts have coverstitched hems. I also taught myself how to use the bind hem stitch on my sewing machine. It’s been a long time. Blogs are patient. The last two years have been intense. I wish I could say that lost weight or won the lotto but that isn’t the case. I did untangle myself from a 20 year marriage and found out that just because you get the job, that doesn’t mean it’s a good job. I now own a house. That’s a change. Been paying the mortgage a long time, but now the house is mine. I did a major clean out of some old landscaping. Hung a beautiful chandelier in the dining room and a Rieker fan in the master bedroom to heat it. Let’s hope that the market improves in the next 10 years and I can get some money back out of it. In the mean time, I have a house. The job – love the paycheck, don’t like the work. Sitting in front of a computer 8 hours a day doing spreadsheets is not for me. I did manage to hang on to my training work and can have up to 4 weeks/year to teach classes. Now that work makes my heart sing – I just can’t make a living out of it. The downturn in the economy doesn’t give folks many options. I am truly glad to be working. I would just like to be working at something else. Still sewing and quilting. I realized last week that 4 out of 5 days I wore clothing to work that I had made. I just published my first review on Pattern Review. The stash contest interests me and I might join the contest. The big news – at Expo this year I am going to pick up a Janome 1000CP. I have wanted a cover-stitch machine for years and finally got the courage to purchase it. The timing couldn’t be better because Janome came out with a newer version and I got this one at 50% off. Can’t wait to get it; to learn something new and improve my sewing. Up here in the Pacific Northwest, night comes very early in the winter. I love this time of year and have taken to calling it “The Deep Dark”. Our day/night cycles change so much, but the times of intense dark and light are very short. The change is like a sin wave which has a very sharp maximum (long days) and minimum (dark days). At the minimum, our sun will rise at 8:30 am and set by 4:30 pm. You go to work in the dark and come home in the dark. People sleep longer and being inside doing inside things is just a perfect way to spend the time. To some, this would sound terrible, but I find it warm and cozy. A perfect setting for the holidays and that wonderful time of relaxation after the holidays. Right now, we are watching the dark creep in a little bit more each day. By the end of January, the days will be getting longer. By April, day and night will be about equal. See, it doesn’t last long. I have a lot more trouble handling the long days, but more about that later. Sewing has been happening or rather I think about sewing. I have some sweater knit from JoAnn’s that I want to make up into a Loes Hines Criss-Cross Top. But first there are still some gifts to make. I bought the cats some Meowie Wowie Cat Nip from Over the Rainbow, a great mail order fabric shop. When it arrived, the cats ripped the envelop to get to the stash. I want to make a bunch of cat nip toys up for my friends with cats. Maybe M. can held during sewing class. Sundays are my day. The kids leave with their dad and I have the day with no obligations. But wait! There is cleaning, shopping and errands, yard work, and the other jobs. I am saying the heck with it. Sundays are for reading emails. I get one every Sunday from eQuilter and love to browse all of the gorgeous fabrics. Sundays are for reading my favorite blogs. Sundays are for “fun shopping” – my choice, not have to’s. Sundays are for sewing. Lately, I have been having Sewing School with M. He is a very unique child. Extremely smart, very athletic, amazing violinist at age 10. Because he is in the 99% percentile of just about everything, he does have some trouble fitting in. He really likes sewing school and I try to do it with just us, no other kids around. Last week we mended some of his jeans. We ironed on patches, both inside and outside patches, then I taught him how to sew them down. We did a nice zig-zag around the outside patch, and then did some crazy darning on the inside patches. He even used rainbow variegate thread on one leg (we had lots of jeans to play with). We have fun. I work on my stuff or just iron clothes and help him along. This week we are making his mom a table mat for Christmas using a flip and sew technique. The fabric is picked out, pressed and we are ready to go. Now, it is off to Costco to get gas and cinnamon for Cub Scouts (apple sauce/cinnamon ornaments for Tuesday night’s den meeting), then I need to mail the rest of my Christmas packages. Laundry is almost done. Did I say that the day was mostly for me? Nice thought, but hard to put into action. I got to sew today! It has been a long time. The sewing wasn’t fancy (just pillow cases), but it sure felt good. My Christmas gifts are done! It was so nice to iron fabric, use a rotary cutter, and turn on the machines. I love the sound of sergers and sewing machines. To make something out of flat fabric, to have mastery over the process was very nice. My kids remind me that I get cranky when I don’t sew. It would be nice to do that every day, but that might be a thing of the past. My next project will be some more PJ’s for K. Then a blouse for me. It would be really nice to have a well fitting blouse pattern. One that I could wear over t-shirts for work. There is so much great quilting cottons out there. Instead of seeing quilts, I see shirts. 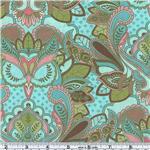 The fabric that I am really intrigued with is called Full Moon Forest by Moda. All of the ornate designs make owls. Very cool looking. Maybe not a blouse for work, but it is certainly an interesting design. It has been so long since I have posted and it is time for an update. My “To Do List” has been overwhelming, but slowly I am clearing off my plate. Eating pieces of the pie. New Job: Getting better. Last week, the people that I work with (and expect so much so fast) realized that no one is training me. This is a new position, my boss is too busy, so I am on my own. That was a nice realization and will make it easier to say STOP! Please rewind the tape and fill me in! I still have a very hard time with the sitting for 8 hours a day. It seems so unhealthy and un-natural. My back went out a week after starting work. Could it have been the stress? Lots of pain. I hobbled around for awhile, but it is much better. Training Work: I leave for a teaching job on Sunday. So in addition to a new job, I have still been working the old one. The old job I adore, that comes so easy to me. It really does hurt to leave this work. I will not burn my bridges and plan to keep my business infrastructure intact and look for chances to do some training. I just need to get some vacation days saved. Volunteer Commitments: Getting through those as well. Delegate. That’s a good word. Kids: They are handling the changes really well. School grades are up or stable. In my mind that is a key indicator of how things are going for them. S. finished basketball and made the JV team for volley ball. We had a really fun Halloween with 10 teens going out for their last Trick or Treat and one 9 year old. I sent them all out with The Kid’s Dad (he, he). The moms stayed home, talked and drank hot cider. Sewing: Does making a “no sew” fleece throw count? I have been working on that for days. Cutting a little here, tying a little there. I also have some pillow cases in progress. On the list are more PJ’s for K. and I would love to make some blouses for me. Once I eat some more of the pie and make room on the plate, I feel like I can get back to the sewing machine. Now that the weather is getting colder the grass will stop growing there will be more time. When I stop working three jobs and there will be more time. Earn some money, get a house keeper (even for one week/month), there will be more time. But — just when you think you are out of the woods, the holidays start to loom… I can feel them, just behind me. Creeping up, ready to pounce. I try to keep it simple, but I adore January when it is all over. Whew! I have not sat down for 1.5 weeks. This working thing is really cutting into my time. There is no down time between coming home and running right smack into kids and their activities. It is going to take a while to get everything sorted out. My kids are used to having me at home, so picking up some of the slack is not what they are used to, so there has been some retraining going on (like emptying the trash, putting dishes in the dishwasher, etc…). Today K. said that they read a book at library called “One Potato, Two Potato” about a family who can throw a potato into a pot and have it double. He said that he would want to throw me into the pot so there could be two of me – one to work and one to stay home. That would be wonderful. In reality, my job is 5 minutes from home. The people are great. I do feel like I have parachuted into Outer Mongolia, but that is getting better each day. I couldn’t have asked for a better situation. It does seem almost magical, so while it hurts to be away from the kids, I am very thankful to be given this opportunity. I did manage to get my nephew’s birthday gift done. No pictures, but it is done. So a little sewing has been done. I also want to make some blouses for work. When to find the time? That is the next big thing to figure out.